Are you traveling with your baby this year? It can be a little stressful if this is your first time flying or going on a road trip together. Trust me, being prepared and packing the right stuff can really make or break a family vacation! We have traveled so many times since our son was born and have definitely figured out our basic essentials for traveling with a baby. If there's one thing I've learned about taking care of a child, it is preparation, preparation, PREPARATION. Start your packing list by adding these essential items. Sadly, I am not a genie so I can't promise you the perfect vacation based off of this list alone. But I can assure you it's a very good place to start! Does your little one have specific medication or ointments they need? Our son suffers from horrible eczema flare ups, especially when we visit our beloved dry state of Kansas. It flared up so badly during our first vacation that he would have been miserable if we hadn't packed his special cream. I also like to add infant's Tylonol in case of a bad teething episode or a fever. It doesn't take up much space and is nice to have if your baby isn't feeling well. I can't emphasize how important it is to bring some sort of mucus remover for your child. Yes, I know it's gross but you need to clear things out if they're having a hard time breathing while eating or sleeping. Our baby boy had horrible allergies when we traveled through the southern states. My husband had to search around an unfamiliar area for a pharmacy that was still open in the late hours. It was stressful waiting until we could find the something to clear his nose. Remember that time your baby had a diaper explosion and you couldn't find a trash can until the next rest stop? What about the time you found out your little one suffers from car sickness? I think this sums up my point perfectly. I almost feel silly including this on the list but there have been too many instances where I desperately needed a bag. I no longer leave the house without it. Think of the items that comfort you when you are traveling away from home. If I don't have a toothbrush or clothes that fit properly, I'm uncomfortable. Sure, I could go out and buy new things. But what if I couldn't? What if I had to survive without a toothbrush for my entire trip? Talk about uncomfortable and gross! Your child has the same comfort needs, just in a different form. Is there a teddy bear they won't fall asleep without, or a blanket they carry around everywhere? Bring these items so the transition to being in an unfamiliar place is a little easier. Bring a few of your child's favorite toys but also mix in a few "new" ones too. And no, you don't need to run out and purchase anything. About two weeks before we travel I will pack a few of my son's toys. He never even notices they're missing and when I pull them out at the hotel it's like Christmas! It doesn't cost me anything and the "new to him" experience keeps him occupied. You do not want to get on a 3 hour flight just to realize you have the bottle but left the formula on the kitchen counter. Write down each item you use throughout a normal routine day so you don't forget anything. And if you're pumping breastmilk, don't forget any of your must-have supplies! Little details like extra batteries or a cooler bag are easily missed. I know this is an obvious one but sometimes our Mommy brains will skip the little details. I have literally packed a pair of shoes for my non-walking child and then forgotten the diaper rash ointment. It's the everyday things that are easy to forget! You obviously have to pack diapers but you also need enough space for your stuff too. For longer trips, bring enough to safely get you there (with a spare or two just in case!) and then buy a fresh package when you reach your destination. Clothing for a baby can be tricky and is the most important necessity behind diapers and food. I hate bringing something only to find out later that it doesn't fit properly. Now I have an item that's taking up space but can't be thrown away. It's not fun but you should try on their outfits prior to the trip to make sure they fit 100%. You'll thank yourself later. We all want our family vacations to be something we look forward to and not dread. Keeping the kids happy usually translates to keeping the parents happy too. You can do this by making sure you pack all of the essentials. Think of basic needs when you're ready to stuff the suitcase. If you cover all of those bases I can guarantee you are in the right direction of a wonderful trip. Happy travels! 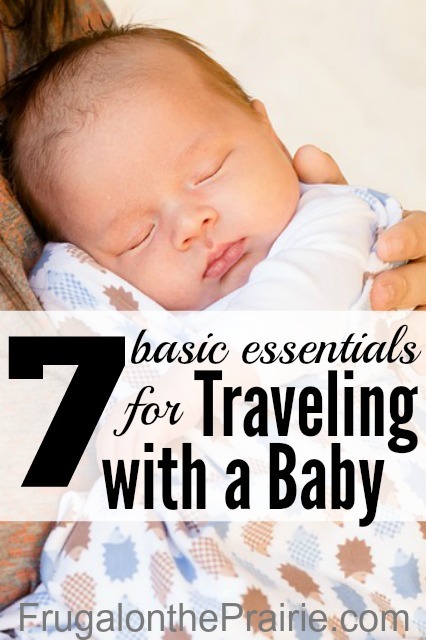 What are your essentials for traveling with a baby?